How do you select the right landscape plants for your garden without turning your property into a virtual carnival of competing attractions? One that plant collectors the world over abhor. ﻿﻿Yes, I know, SOOO UNCOOL! But OH! The rewards of exercising just a little discipline! Get the most out of your plants! Award winning landscape designers start with the elements of design, and apply them to their primary medium...plants. In the contemporary garden above we find an excellent example. The effects achieved in the garden result from a clear understanding and application of the forms, textures, and mass of each plant, and from considering the design of the garden as a whole. Each plant plays its supporting role and it is the whole of the garden that is perceived, rather than its parts. In the quote above from Roberto Marx, he is thinking this way. He recognizes that shape, form, color and the other elements of design are what make up a landscape. 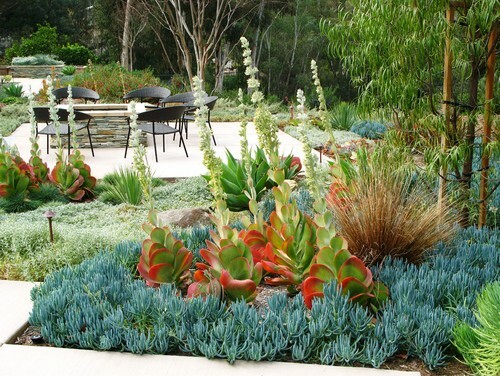 The difference between a designed landscape and a garden stuffed with hundreds of one of a kind plants is a recognition of the role of your plants within the overall design. The landscape plants you choose must support these final goals, while contributing a sense of beauty and unity to your garden design. 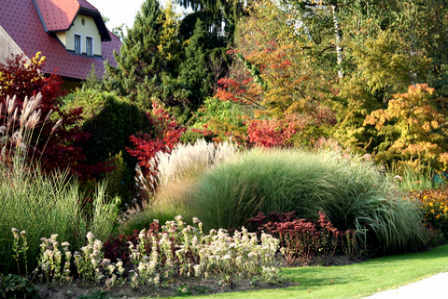 Explore the vast world of landscape plants for the most useful design qualities. This will allow you and exploit them for the best features, and thus create an incredible and unique landscape . Evergreen trees are trees that remain green for all (or most) of the year. These plants provide permanent structure, year round interest, color, texture and repeated form to your garden spaces. 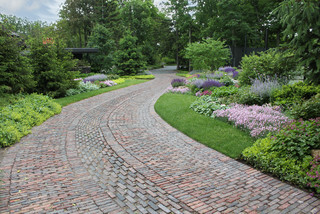 In the example above, this driveway will maintain a strong winter interest primarily due to the use of evergreen trees. Deciduous Trees are trees that lose their leaves during the late fall and winter seasons. They supply an ever changing panoply of dramatic structure, foliage, texture and expressive line. Think about these plants during all seasons. Each season will offer a different expression of life to your garden. 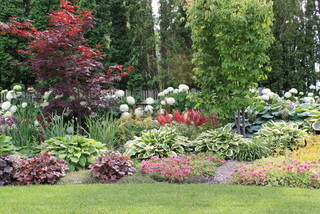 Landscape Shrubs are often evergreen, but many are deciduous. These plants are called shrubs because they usually maintain a more compact form in the garden. They offer a multitude of semi-permanent, interesting forms, textures, colors and sizes to your design. Many shrubs lend themselves to manipulation, such as the boxwoods in the garden above. Large Perennials are plants that return for at least two years in a row, but will eventually die. The life span of perennials can be from two years (usually called biennials) to well over the life span of a human being. As a group, perennials provide a changing tapestry of color, form, shape, and texture easily edited to maximize the design potential of your garden. View these as semi-permanent additions to your garden, remembering that foliage and form are as important, perhaps more important, than that lovely fleeting flower! 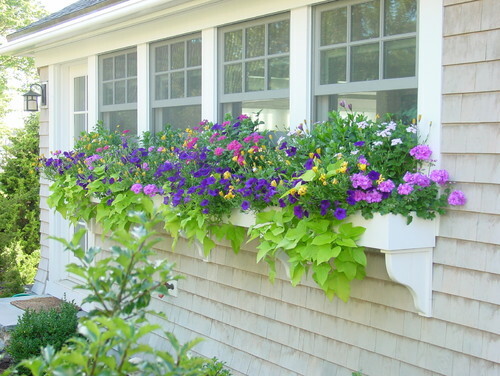 Annuals are plants that complete their life cycle within one year. Some of these plants create seeds and will grow again next year as new plants, others will not set seed and are therefore unable to regenerate under most garden conditions. Annuals are typically best used in garden beds as fill in material, to create dramatic focal points, or in baskets and pots as accents. Use them to add volume and mass to a garden bed, to add color in areas where other plants cannot thrive, or to accentuate areas of the garden for interest. Bulbs share characteristics with annuals, in that they usually have vibrant and fleeting flowers, but these plants store nutrients in fleshy roots that may be called bulbs, corms, or rhizomes based upon general shape and root characteristics. 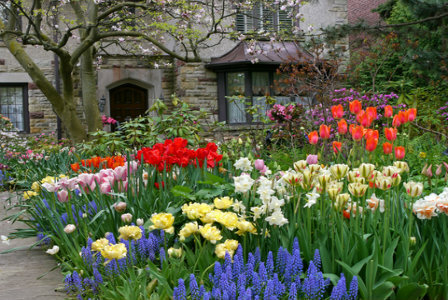 Bulbs provide brief interludes of color and form that are best enjoyed in large drifts or as accent plant material among groundcovers and at the base of trees. Remember that these plants usually need to die back in order to rejuvenate for next years season, so plant amongst other perennials in most situations. Groundcovers are a group of plantings that share one common characteristic, in that they easily extend themselves to cover the ground, loosely, or closely, with their progeny. They generally spread themselves over large areas if left to their own devices. 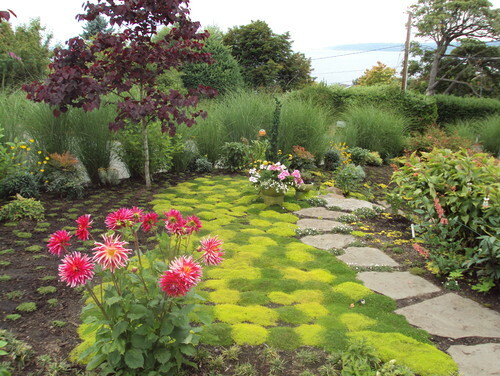 Groundcovers may range from a few centimeters tall to several feet, and can have very fine, or very coarse textures. Groundcovers as a group help provide weed control, while affording amazing textures, a sense of unity, and vibrant accents to the garden. They can be used to form carpets as in the above garden, or to mix and match for a tapestry like effect. 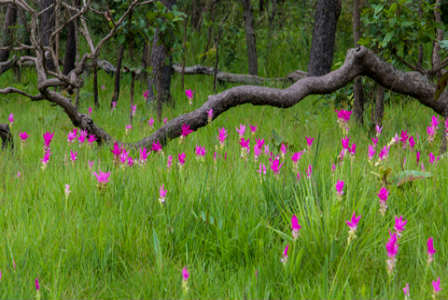 They are often used to advantage at the foot of other larger plantings. Grasses may be annual or perennial in nature, but as a group share the characteristic of having long, narrow stems with feathery seed heads. Succulents share the characteristic that they are able to collect and capture moisture and store it for long periods, thus meeting their needs for nutrients in environments that would otherwise be hostile. 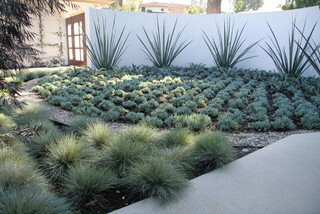 Grasses and succulents are useful for drier or more difficult sites, providing some of the most interesting forms and textures available in the plant world. Selective and careful use of variety in texture and form can enable an unusual and dramatic statement. Climbing plants share the characteristic that they have adapted themselves to grow upward, often on vertical supports such as walls or fences, or alternatively are able to clamber long distances along the ground without the need to generate additional roots. Vines, as a subclass of climbing plants, tend to have weaker stems, unable to climb upward without external support. 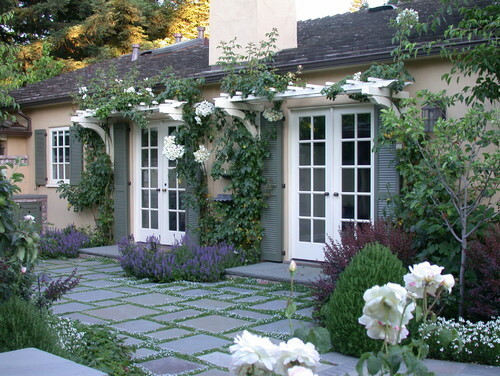 Vines and Climbing Plants provide a strong vertical element in your garden, while bringing color, texture and expressive line to a full crescendo in the garden. They provide enclosure, vivid texture, or screening with equal success. 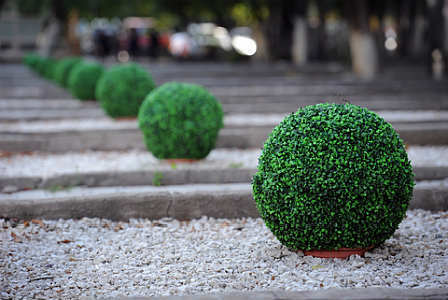 These are the common types of landscape plants available as your primary medium to design a beautiful garden. Remembering the primary design applications of these plants helps to net a unified, holistic design result for your garden. Married with an honest site assessment, a strong understanding of design principles, and a thoughtful review of the permanent design elements of your landscape, there is available to you an impressive diversity of style, mood and function that approaches the immeasurable. Have fun exploring how to apply this thinking to your collection of landscape plants!